The last day of fall 2013 banding at BBBO, really! 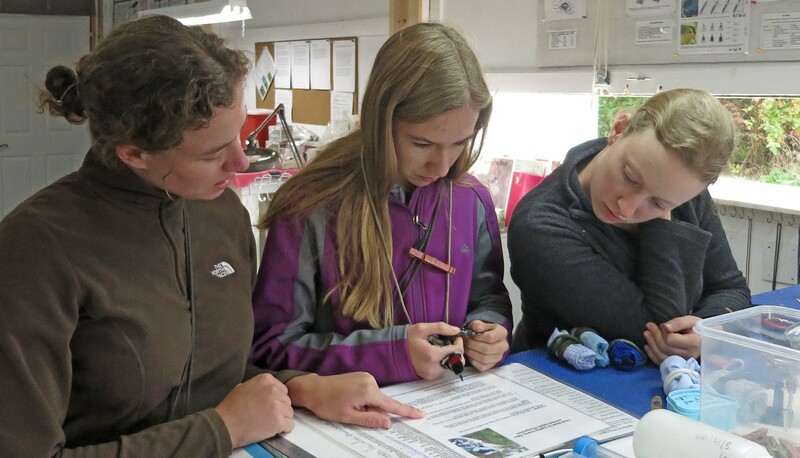 brookser	Fall Banding	Comments Off on The last day of fall 2013 banding at BBBO, really! Friday October 25, 2013. 56 new birds of 12 species. While yesterday was the last full day of banding, today was the end of the season. With winds out of the WNW last night, we opened all of the nets again this morning. We had a very good day. Slate-colored Juncos, White-throated Sparrows, Hermit Thrush, and Kinglets (Ruby-crowned and Golden Crowned) were the dominate species. Since we needed to prepare the banding station for winter, we closed after four hours and took down the nets, cleaned up the station, and put the equipment into storage. All in all it was a very good day at BBBO. What small gray bird with white tail feathers did we capture today? 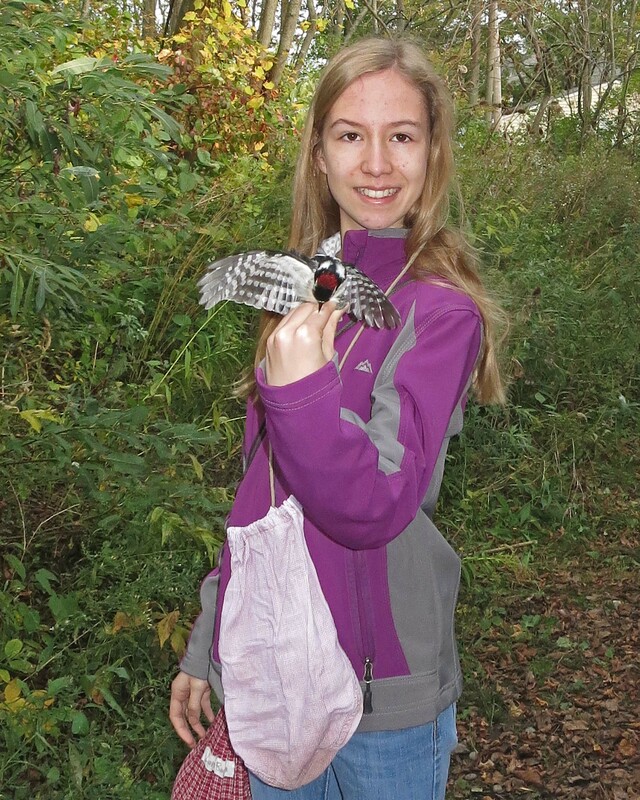 Andrea Patterson	Fall Banding	Comments Off on What small gray bird with white tail feathers did we capture today? Thursday October 24, 2013: approximately 25 new birds of approximately 10 species, and approximately 30 recaps. (I left the tally sheet at the station! Numbers will be updated . . . eventually!) Once again we avoided impending bad weather and managed to get in our full six hours. In preparation for closing today, we graded all the nets (so we know which ones to save and which to burn), and we took down the alphabet trail. 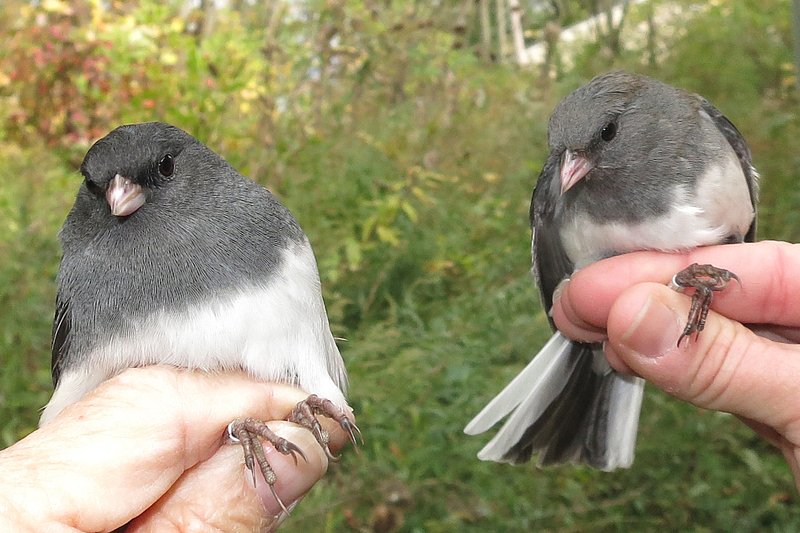 Our numbers were a severe drop from yesterday, and – shockingly – there was not a single new junco in the bunch! 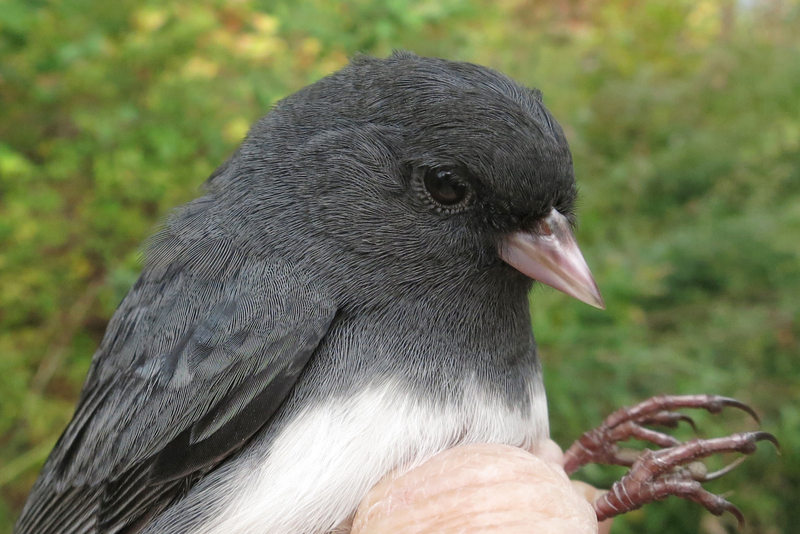 In addition, there was only one junco recaptured. They must have swooped in, fussed about for a few hours, and then swooped back out . . . perhaps in search of kindly souls who keep well-stocked feeders. So what was the little gray bird with white tail feathers??? A young Blue-gray Gnatcatcher brightened our day. 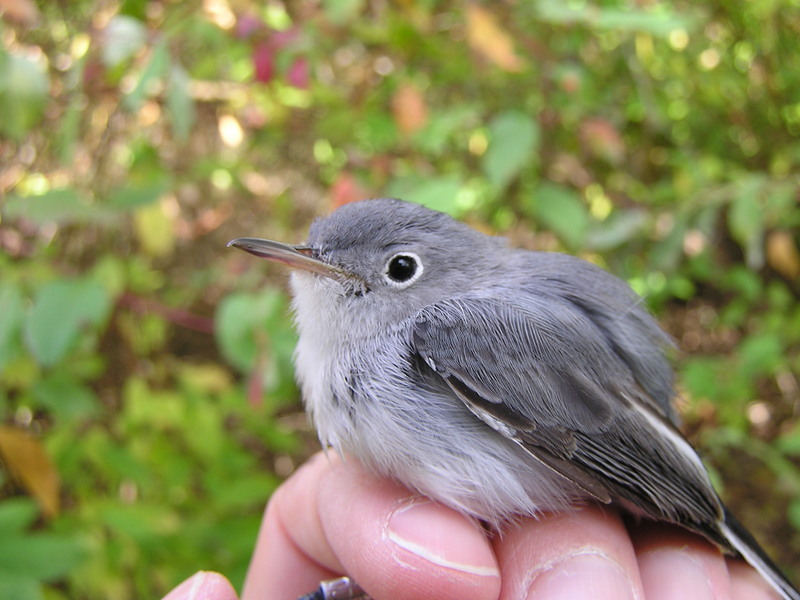 A Blue-gray Gnatcatcher!!! 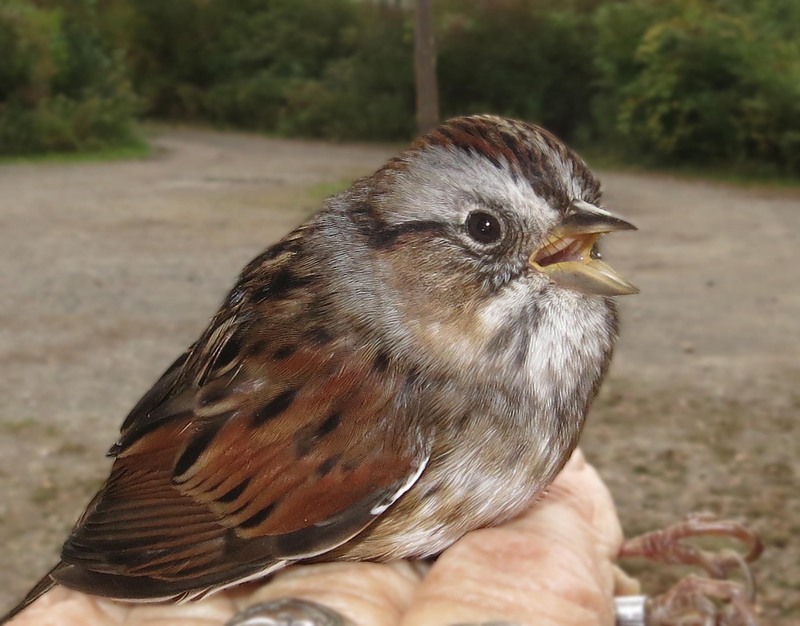 They are not often reported in our part of New York in October, and we haven’t banded one since the end of August. But the gnatcatcher was not our only little gray bird that caused a stir today. . .
We were spoiled last year by a couple dozen titmice. This year, we were not so lucky so we were all grateful to see one today. 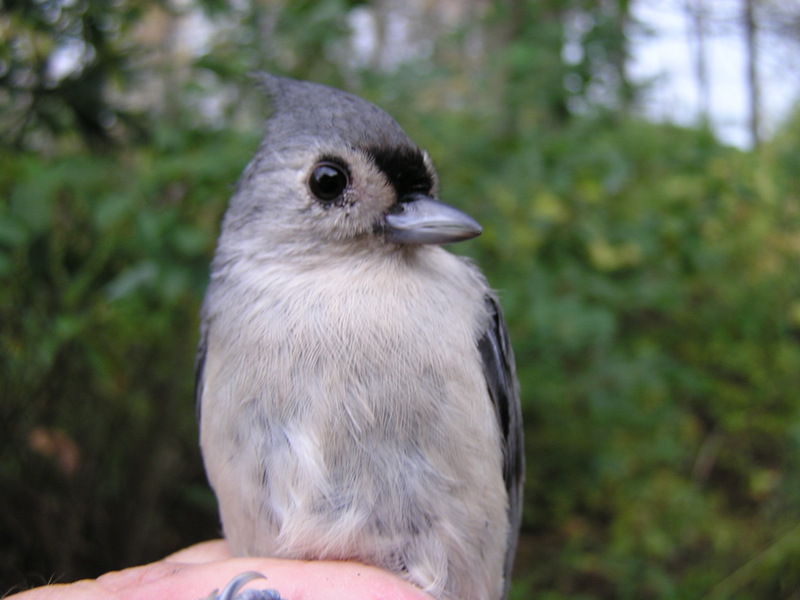 We all love Tufted Titmice, and this little fellow was the perfect end to our day. Wednesday October 23, 2013 152 new birds of 12 species; 11 recaps. 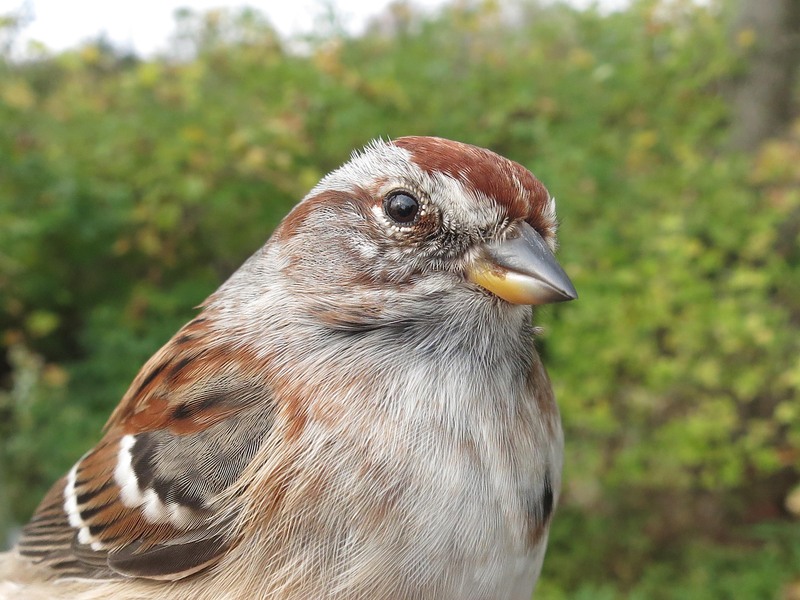 New species Tree Sparrow. with nets full of Juncos!!!!! Then the next run there were even more, so we had to close the 80’s and 70’s and call in our second scribe so we could catch up. Tree Sparrow and then a beautiful Fox Sparrow. And then Gary came in and said he had a Bald-headed Eagle!! 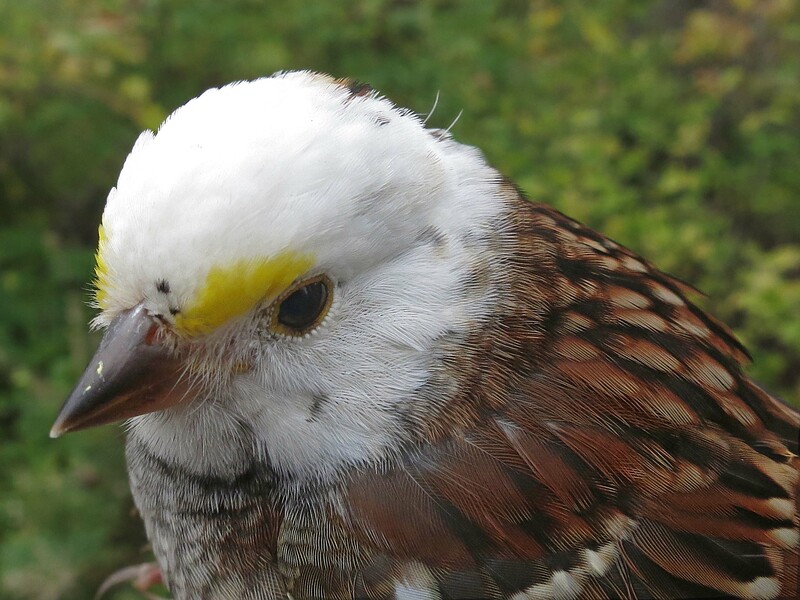 At which Jena pulled out a leucistic White-throated Sparrow from the bag!! Many More Leaves Than Birds Today! brookser	Fall Banding	Comments Off on Many More Leaves Than Birds Today! Tuesday October 22, 2013 21 new birds of 8 species; 17 recaps. It was a chilly, blustery day but with plenty of sunshine. We picked more leaves than birds out of the nets! 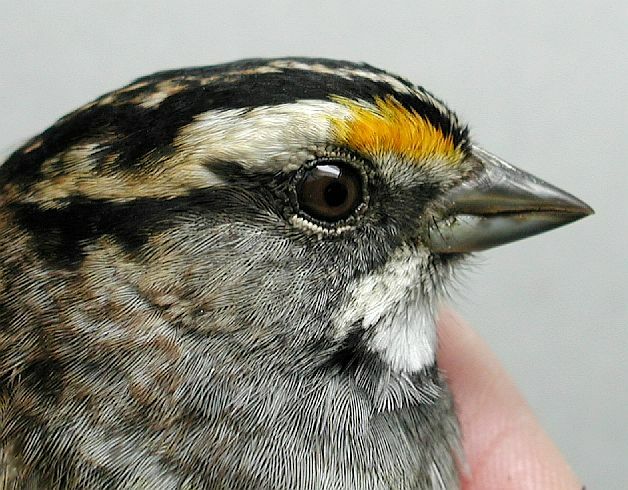 White-throated Sparrow was the most numerous species with 9 banded. all of this Fall season! Monday October 21, 2013. 26 new birds and 28 recaps. It is rather sad to say it is my last day at BBBO for the season. It warmed up to the low 60’s by noon time so we had a pleasant day. There were 10 White throated sparrows of the newly banded group and 9 Hermit thrushes. 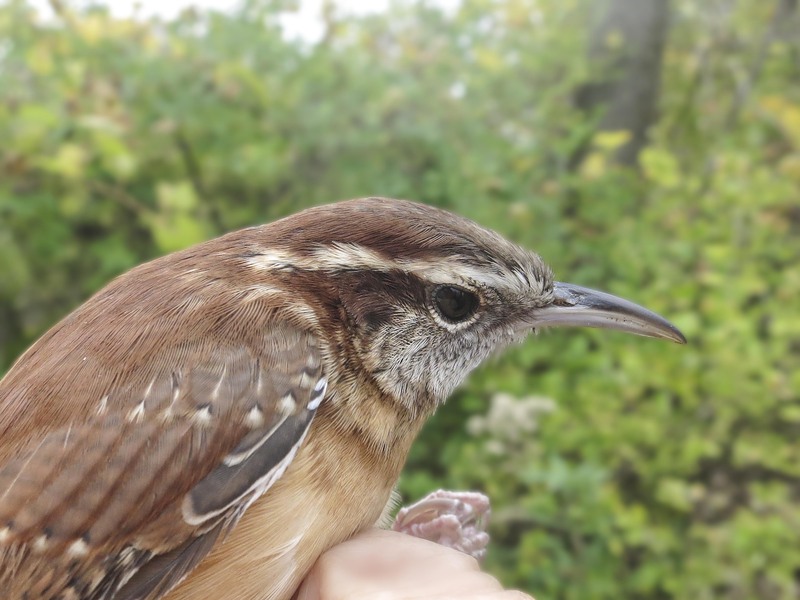 The catch of the day I suppose was the Carolina Wren which has hung around all summer. It has been a wonderful season and I can speak for the staff there today, that we regret having to say good by for the season and we are looking forward to spring already. Sunday, October 20, 2013. 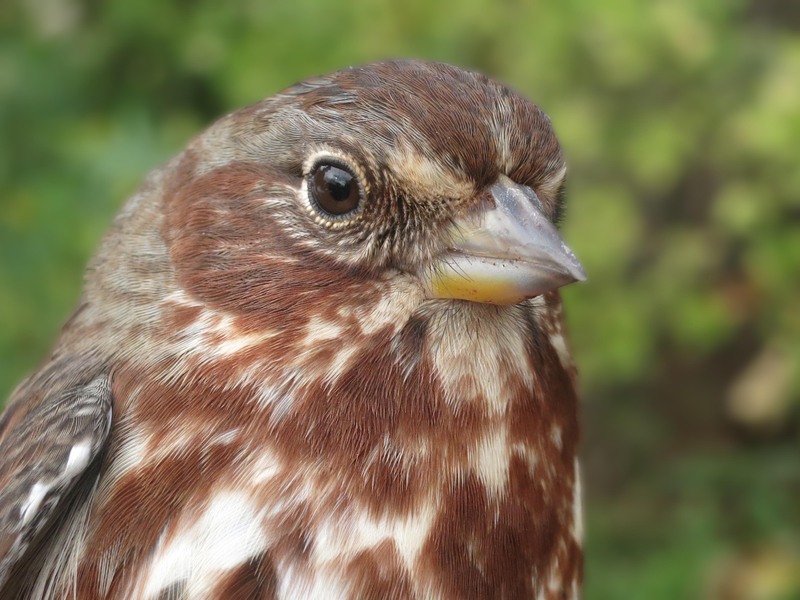 28 new birds of 7 species; 25 recaptures. The bird of the day was Hermit Thrush with 9 new bands. Golden-crowned Kinglet was close behind with a total of 7.
came in first with 11. We had thought about closing a bit earlier but then we would have missed a visit from our friendly Carolina Wren at hour 6.